I'm afraid I can't tell you when I first conceived of a romance trilogy based on Shakespeare's "pleasant conceited comedie" Love's Labour's Lost. Ideas tend to rattle around in the unoccupied corners of my brain, bumping into each other and mixing themselves up, until there's no telling where they came from and where the devil they're headed. I can say this: on the last day of the annual Romance Writers of America conference in Orlando, I found myself lounging in exhaustion on a sofa in the hotel's soaring atrium with my Incomparable Agent. She was wearing, I recall, a divine pair of Chanel flip-flops, which swung from her manicured toes as I moaned about the dignified slowness with which the gears of publication were grinding out my first novel, written under my own name. At which point my Incomparable Agent stifled a yawn and said: "We need to get you writing again. Any ideas?" "Well," I said, sitting up and straightening my Tasteful Blue Sheath Dress to disguise the desperate scramble of my brain, "I do have this vague notion of a romance trilogy based on a Shakespeare play. Three men swearing off women for a year of scholarship, three women vice versa, and they all end up in the same castle in Italy." I paused. "I know it's a bit far-fetched." "This is romance," said my Incomparable Agent. "It's perfect. Just make one of them a duke." In short order, we had put together a proposal for Berkley, Berkley had responded with an offer, and I was left alone with my rattling brain to put the story together. Now, at this point, I fear I must disclose to you my Darkest Secret: I have no original ideas at all. Not one. I am merely a literary magpie, gathering up bits and pieces from the heaps of cultural treasure around me and putting them together into haphazard shapes. 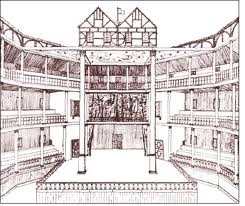 Shakespeare is an invaluable resource for writers like me, because everything's already there: plots, characters, emotions, all so timelessly human that one can simply take the bare bones straight from the Bard, flesh them out, and dress them up to suit one's taste. And Shakespeare lends himself especially well to romance, with his strong women, his intrepid men, and his deft comedic narratives of mistaken identity and love potions and high society mixing with low. But Shakespeare isn't the only inspiration. The trilogy is set largely in Italy, after all, and I wanted to plunge my proper English characters into that uniquely Italian well of passion and melodrama, with an enchanted castle and a centuries-old curse to match. Here I turned to Giuseppe Verdi, whose La Forza del Destino gave me the Tragic History of the Castel sant'Agata, and whose Don Carlo outlined the love triangle entangling the couple in my second book. Ideas, therefore, proved easy to come by. The great challenge of the Affairs by Moonlight trilogy arose from its very structure: I had to tell three separate love stories that were occurring more or less simultaneously. "Before you begin writing," said my editor, with exquisite tact, "you might want to reconsider the bit about the simultaneous storytelling. We've had authors try it before, and it isn't always...successful." I let fly my hand with an insouciant wave. "Oh, I'll manage." This, my friends, is what the gods call hubris, and they generally frown upon it. Of course, it was no trouble at all in the first book, A Lady Never Lies. I simply went about my business, moving Finn and Alexandra about at will, tossing in the other characters as the situation demanded, swinging any dangling plot threads carelessly into the future. A Gentleman Never Tells, the second book, required a little more planning, but Roland was such a charming devil he managed to talk himself (and Lilibet) out of every difficulty, even the trifling matter of a villainous and very jealous husband. By the time I came to write A Duke Never Yields, however, I faced a jumble of disconnected yet indispensable puzzle pieces with no helpful box lid to guide me. I had an arrogant and rather unlikable duke covered with goose down, an impish heroine with her nose in everyone else's affairs, an evening rendezvous in a peach orchard, a naked moonlight chase by the shores of a Tuscan lake, and an ancient lovers' curse with no obvious resolution. In short, I was stuck. I sat and stared at my computer screen. I drank coffee. I ate chocolate. I gave up and wrote another novel under my real name. By then, Wallingford and Abigail's deadline was looming. The inhabitants of my enchanted Italian castle were desperate for release from their centuries-long purgatory. I had to think of something, some spark to Light the Creative Bonfire. I won't reveal how I brought all my puzzle pieces together with a single theme, or how my duke learned to make himself likable, or how the Horrid Curse of the Castel sant'Agata was finally broken. But I assure you, my rattling brain did not come up with the idea first. View "A Duke Never Yields" synopsis.